The development of Japanese cuisine owes much to the humble kōji or kōji-kin. A type of fungus or mold, it is used in all kinds of foods and beverages. It’s as important in Japan as the fungi, bacteria and yeast that give character to cheese, yogurt, wine, beer and bread are in the West. The difference is that just one type of fungus is used in so many foods. Kōji (Aspergillus oryzae) was probably domesticated at least 2,000 years ago. It is used to make sake, mirin, shōchū, awamori (an Okinawan beverage), rice vinegar, soy sauce and miso – all ingredients that define Japanese food. No wonder that it was declared the kokkin (national fungus) by the Brewing Society of Japan, and the genome was closely protected until 2005. Besides Japan, it is also used extensively in China and Korea to ferment and mature various foods. To use kōji, spores are mixed into steamed rice (potatoes, wheat and soybeans are also used, depending on the purpose), then allowed to mature for a period of time in a warm environment, about 50 degrees Celsius. 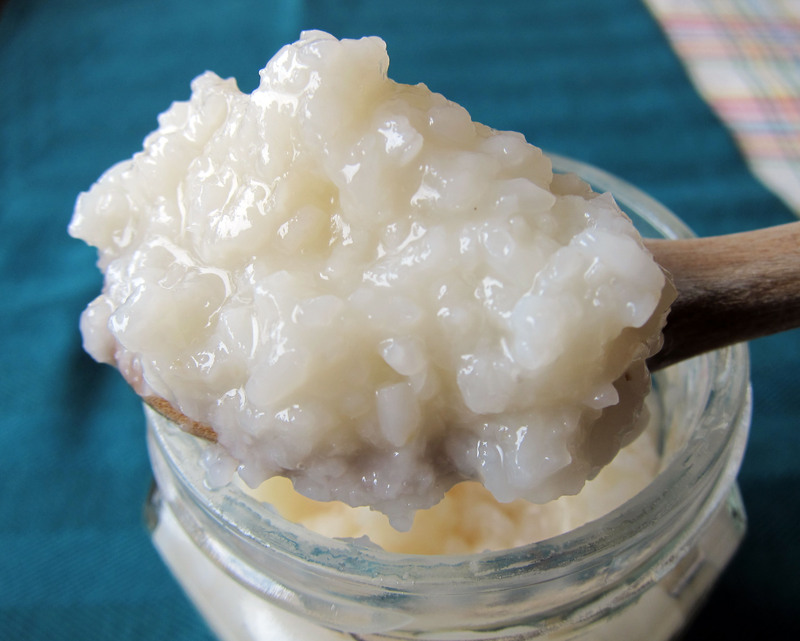 The kōji turns the starch in the rice into sugar (a process called saccharification) and releases a variety of fatty acids and amino acids including glutamate, the basis for the “fifth taste,” umami. This kōji-rice mixture is called kome-kōji. To make alcoholic beverages such as sake, the sugar is allowed to develop further into alcohol. In miso and similar foods, the kome-kōji is mixed with other ingredients such as steamed soybeans and allowed to mature. The addition of salt inhibits the development of alcohol, and the umami is able to develop. This is what gives miso and soy sauce their distinct, savory and delicious flavor. Kome-kōji that has been allowed to saccharify until it tastes very sweet is used to make amazake, a sweet nonalchoholic beverage served hot that is a traditional part of Hina Matsuri (Girls’ Festival) on March 3. A recent development in Japanese cuisine is the increasing popularity of shio-kōji. Shio-kōji is kome-kōji with added salt, which is allowed to mature for a few days at room temperature. The salt and the lower temperature inhibit the development of simple sugars, but not the amino acids. This results in a condiment that is full of umami, with a hint of sweetness and enough salt to bring out the flavors of various foods. 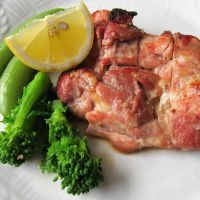 Shio-kōji has been around for hundreds of years, mostly used to marinate or pickle vegetables, but it started to get a lot more attention around 2007 or 2008 on Japanese food blogs and popular recipe sites such as Cookpad. Last year saw a veritable explosion of interest in shio-kōji recipes in Japan, both in print and online, and the trend looks to continue in 2012. Why the sudden interest in such a traditional food? One reason may be that it’s really easy to make. All you need is some kome-kōji and salt, both of which are easily obtainable at any supermarket in Japan. Another reason may be that using shio-kōji instead of salt or soy sauce to add flavor can help to reduce salt intake. A more somber reason is a response to the continuing concern about the radioactive material released into the environment in the aftermath of last year’s accident at the Fukushima No. 1 nuclear power plant. 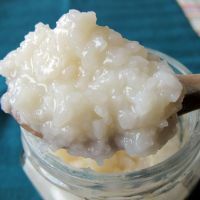 As people worry about what is safe to eat, there is an increased interest in the purported health benefits of traditional Japanese foods, including foods that have been fermented or matured with kōji. Shio-kōji is riding on that trend because some health-food advocates say that kōji may help to strengthen the body’s immune system. But whether you buy into this theory or not, shio-kōji is worth trying just for its unique, delicious flavor and ease of use. These days it is relatively easy to buy ready-made shio-kōji in Japan at a well-stocked supermarket, in a department-store food hall or by mail order. It usually comes in a jar, and looks just like rice porridge with a hint of gold color. If you can’t find shio-kōji, though, you can probably find kome-kōji. Readers outside of Japan may be able to find kome-kōji at a Japanese grocery store, but if not you’ll have to make your own from kōji spores; this can be obtained from online merchants, if you are adventurous. To make your own shio-kōji from raw kome-kōji, mix 1 kg of kome-kōji with 300-350 grams of salt — or 30-35 percent of the weight of the kome-kōji; increase both amounts proportionately as desired. Add enough water to produce an oatmeal-like consistency. Mix it very well so that the salt dissolves completely — your clean, bare hands are the best tool for this. Put it in a nonmetallic container and cover, then leave the container in a warm, dark place in your home. Open the container and give it a good stir at least once a day; if the mixture looks a bit dry add a little water. Leave it like this for at least seven days in the winter or five days in the summer. Once ready, store the shio-kōji in the refrigerator and use within a week; it can also be frozen for a couple of months, and defrosted as needed. You can use shio-kōji for all kinds of savory cooking, not just Japanese dishes. It makes a great marinade for meat, fish, vegetables or even tofu. For meat and fish, coat both sides well in shio-kōji and leave in the refrigerator for about 30 minutes. Wipe off the excess, and grill or pan-fry. The shio-kōji alone will give the meat or fish a wonderful flavor and color. To marinate vegetables such as cucumbers, carrots or cut-up daikon radish, put some shio-kōji in a container or plastic bag, put in the vegetables, then mix (or if using a bag, massage it gently from the outside) to completely coat the contents with the shio-kōji. Leave for an hour or overnight to make flavorful “instant” shio-kōji pickles. To marinate firm (momen) tofu, drain the tofu well, wrap in a piece of gauze or cheesecloth, then coat it thickly on both sides with shio-kōji and leave in the refrigerator for up to three days. Drain off any excess moisture and slice, and eat as-is. Some people swear that shio-kōji-marinated tofu tastes a little like cheese. The easiest shio-kōji marinade of all is hard-boiled eggs. Just leave the eggs (with shells off) in a bed of shio-kōji for up to a week, taking out and eating as desired. 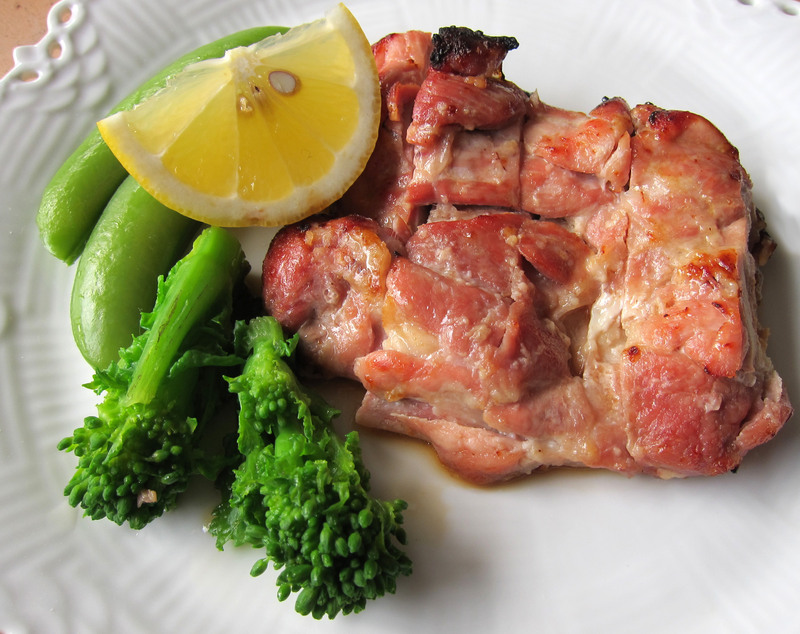 Shio-kōji can be used for much more than marinating. Try putting a spoonful in tomato sauce, for instance, instead of or in addition to salt. Some people add a little bit to miso soup and reduce the miso. A rather unusual way to use it is to add it to cooked oatmeal — if you like your oatmeal salty instead of sweet, that is. And of course, it’s a great addition to okayu (Japanese rice porridge). Some adventurous Japanese food bloggers have even tried it in sweet dishes with success. Will this new-yet-old condiment be embraced by the rest of the world, in the way miso and soy sauce have been? Time will tell, but I think its chances are pretty good. Makiko Itoh is the author of “The Just Bento Cookbook” (Kodansha USA). She writes about bentō lunches at www.justbento.com and about Japanese cooking and more at www.justhungry.com. Shio-kōji makes a very flavorful base for a salad dressing. It may look a bit strange, but the flavor will more than make up for it. Besides the vegetables suggested, try boiled potatoes, kabocha (squash) or carrots. This dressing works well on a crisp green salad too. Wash and cut the broccoli and nanohana florets into bite-size pieces. Reserve the broccoli stalks for another dish. Cut the tips off the snow peas. Halve the tomatoes. Bring a pot of water to the boil. Add a little salt and the broccoli florets to the pot, cook for 2 minutes then add the nanohana and the snow peas. Boil for another 2-3 minutes until the vegetables are crisp-tender yet still bright green. Drain. Put the dressing ingredients into an empty, clean glass jar. Shake well until combined. Arrange the vegetables on a plate and pour the dressing over. Dressing variations: Add one or more of the following ingredients to the basic dressing mix: 1 tbsp irigoma (toasted sesame seeds); 1 tbsp finely grated raw onion; 1 tbsp fresh chopped parsley; a few drops of dark sesame oil. You can also vary the flavor by trying different vinegars, such as balsamic vinegar or white-wine vinegar. Replacing some or all of the vinegar with citrus juice such as lemon or yuzu is interesting, too.